symphonies, concerti, chamber music and solo pieces. A “constructivist” who values craftsmanship above all else, who is in no way rejecting the means that tradition has handed him. Luc Van Hove (Wilrijk, 3 February 1957) studied at the Royal Flemish Music Conservatory in Antwerp, where he earned his first prize in solfege, piano, chamber music, music history, counterpoint, fugue and composition, as well as diplomas in transposition, music analysis and musical form. He received instruction in composition from Willem Kersters. He subsequently pursued advanced studies at the Mozarteum in Salzburg and at the University of Surrey (Guildford, U.K.). He has been awarded numerous distinctions, such as the Albert de Vleeshouwer composition prize (1984), the Annie Rutzky prize, crowning the end of his studies (1984) and the Belgian Artistic Promotion prize from SABAM (Association of Belgian Authors) (1990). 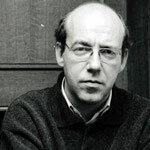 In 1991 he was guest composer of the Week for Contemporary Music in Ghent, in 1994 composer in residence of the Flanders Festival and in 1997 of I Fiamminghi in Campo. Luc Van Hove teaches composition and analysis at the Lemmens Institute in Leuven and at the Royal Flemish Music Conservatory in Antwerp. - M. DELAERE, art. Van Hove, Luc, in S. SADIE (ed. ), The New Grove Dictionary of Music and Musicians, 2de uitg., 2001, verschijnt in 2001, deel, pag. Since 2001 Member of the Royal Flemish Academy of Belgium for The Sciences and the Arts. Since 1993 Professor of composition at the Conservatory of Antwerp. Since 1984 Professor of analysis and composition at the Lemmens Institute in Leuven. 1984 Degree in composition at the Conservatory of Antwerp in the class of Willem Kersters. LA STRADA, opus 45 (2007) Opera in two acts, orchestra, vocal soloists, choir, children’s choir. SYMPHONY III, opus 39 (2001) for orchestra. KAMMERKONZERT, opus 36 (1998) for cello and ensemble. SYMPHONY II, opus 34 (1997) for orchestra. PIANOCONCERTO, opus 32 (1995) for piano and orchestra. TRIPTIEK, opus 29 (1993) concerto for oboe and orchestra. STACKED TIME, opus 26 (1990) concerto for electric guitar and orchestra. SYMPHONY I, opus 25 (1989) for orchestra. SEPTET, Opus 24 (1988) for ensemble. SONATINE, Opus 11 (1982) for piano solo.